How species originate and evolve in this world is one of the fundamental knowledge quest that has been haunting the humankind ever since his inception on earth. Charles Robert Darwin in 1859 after a great effort published his work on principles of evolution - The Origin of Species. His theory of evolution is based on the principle that all life is related and has descended from a common ancestor, the birds and the animals, the fishes and the flowers are all related. Darwin's general theory presumes the development of life from non-life and stresses a purely naturalistic (undirected) "descent with modification". That is, complex creatures evolve from more simplistic ancestors naturally over time. In a nutshell, as random genetic mutations occur within an organism's genetic code, the beneficial mutations are preserved because they aid survival - a process known as "natural selection." These beneficial mutations are passed on to the next generation. Over time, beneficial mutations accumulate and the result is an entirely different organism (not just a variation of the original, but an entirely different creature). This is indeed a magnificent discovery. But, not many would know that this principle of evolution has been already touched upon by the great Saivite Saint Manickavasagar in his monumental work - Thiruvasagam. He lived in 9th century AD, approximately 1000 years prior to Darwin publishing his theory of evolution. The first chapter of Thiruvasagam is known as Sivapuranam and in that, the verses 26-31 sings about the theory of evolution as follows. Stone, man, and demon. 'Midst Thy hosts I served. The form of mighty Asuras, ascetics, gods I bore. In every species born, weary I've grown, great Lord ! In this verse, Saint Manickavasagar by describing his own path of evolution from mineral kingdom, plant kingdom, animal kingdom, human kingdom, demonic beings and Devas throws light on the theory of evolution in a subtle way. It is evident that he has attained the highest state of realisation with Lord Siva and he could visualize his own path of evolution through this grand scheme and also ascertain it is the same Lord who is the life force in all these forms. This song is from Thiruvasagam by Manickavasagar. Thanks for pointing this out. I have corrected this oversight error. 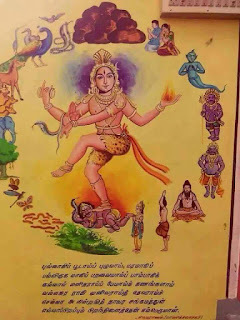 The Dharmapuram (famous for the Madhar madapidiyum devaram) is shown nearer to Mayavaram. 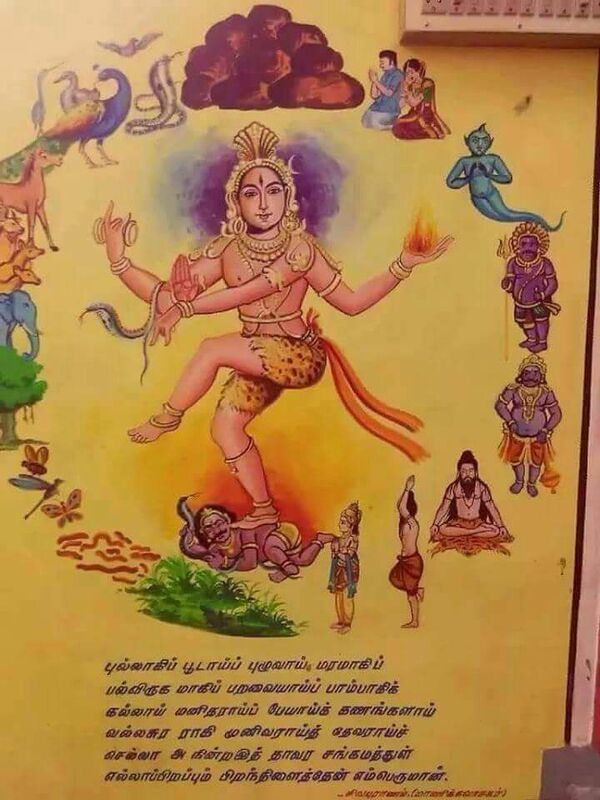 I checked this with few Adiyars who have visited Dharmapuram. They say it is nearer to Karaikal. You may please check and correct - if need be. Evolution is a universal nature of God and his universe. There is evolution of all souls on the spiritual plane and also evolution of all living species on the physical plane. The Vedas revealed this truth thousand of years ago.